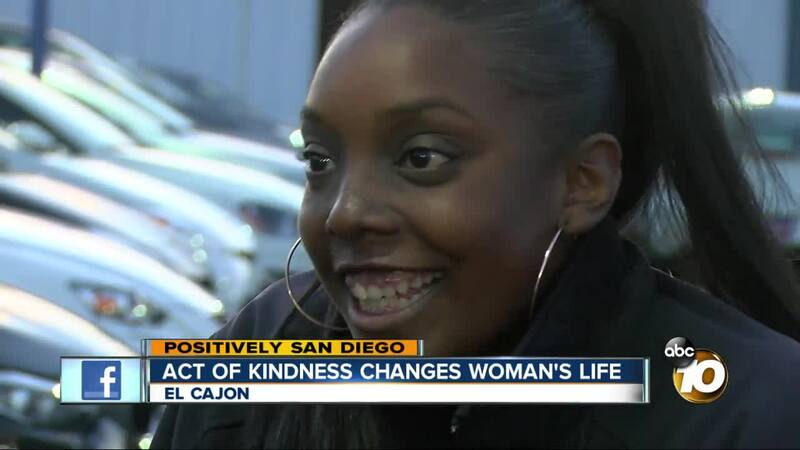 EL CAJON, Calif. — Kayla Cooper has a new car after a man overheard her conversation with a salesman not end well. Dan Laguardia was trading in his Scion at Auto City in El Cajon, California, within earshot of Kayla’s meeting. “I could kind of tell she wasn’t getting what she was there for,” said Laguardia. Cooper, who works two jobs in addition to attending nursing school, says the salesman was nice but the down payment they were looking for was not, so she left Auto City crying. “I would have to literally pull a needle out of a haystack to try to get myself a car so I could get to work,” Cooper said. “The car had more value to her than it did for me trading it in,” Laguardia said.